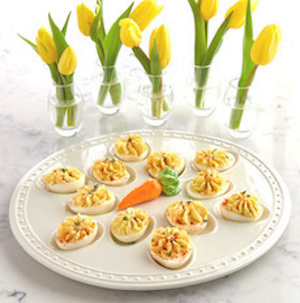 Nothing says springtime like a platter of deviled eggs, and nothing serves them up quite like Nora Fleming! Mini charms secure to any Nora Fleming serving piece with a peg-and-hole assembly. Interchange with other Nora Fleming Minis (sold separately) to customize pieces for different holidays, seasons, special occasions and everyday events. Come in and see all the Nora Fleming serving pieces and Minis available at The Butter Paddle. Entertaining is easy with Nora Fleming! The 4-piece set of 7” Plates by Vicki Sawyer is packaged for gift giving. Also available on a Mug with matching gift box. New bone china; both are dishwasher and microwave safe. There is also a food-safe decoupaged Wood Laquer Tray, a 16.5oz insulated Hot/Cold Water Bottle, and Party Napkins to match. Clip on earrings are a great choice for women without pierced ears. 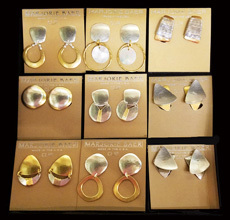 The Butter Paddle offers a large selection of Marjorie Baer jewelry including necklaces and the best and most comfortable clip on earrings for women. Marjorie Baer jewelry is brass based with sterling silver plating and some patinas to add a rich antique look and 100% nickel free. Have your cake and eat it, too, on this darling ceramic, scalloped-rim birthday plate. Featuring hand-painted design, "TODAY IS MY BIRTHDAY!" sentiment, and a well to hold a birthday candle, this keepsake dish is sure to be a favorite from year-to-year. Blow out your candle and make your wish! It's time to celebrate YOU! We don’t think you will have any problem getting the kids to eat these carrots! 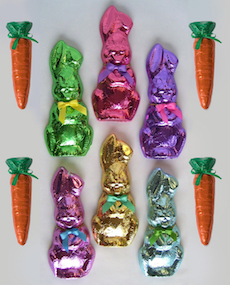 Gosanko solid chocolate Bunnies and Carrots come in milk or dark chocolate. Gosanko Chocolates are made exclusively with award winning chocolate from the Guittard Chocolate Company, and are perfect for Easter Baskets. In a large bowl add potatoes, eggs, onions and celery. In a small bowl whisk together Earth & Vine Lemon Dill Mustard, mayonnaise and sour cream. Toss into potato salad and season with salt and pepper.